Used to start the engine. Used to lock and unlock the doors. To unfold the key, press the release button (1) then the key will unfold automatically. To fold the key, fold the key manually while pressing the release button (1). Do not fold the key without pressing the release button. This may damage the key. 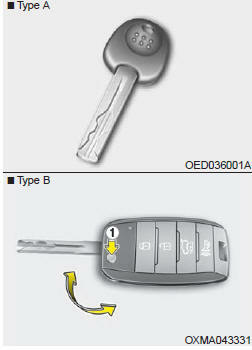 Use only Kia original parts for the ignition key in your vehicle. If an aftermarket key is used, the ignition switch may not return to ON after START. If this happens, the starter will continue to operate causing damage to the starter motor and possible fire due to excessive current in the wiring. Leaving children unattended in a vehicle with the Ignition key (smart key) is dangerous even if the key is not in the ignition switch or start button is ACC or ON position. Children copy adults and they could place the key in the ignition switch or press the start button. The Ignition key (smart key) would enable children to operate power windows or other controls, or even make the vehicle move, which could result in serious bodily injury or even death. Never leave the keys in your vehicle with unsupervised children, when the engine is running. 1. Close all doors, engine hood and tailgate. 2. Press the lock button(1). 3. All doors and tailgate will lock. The hazard warning lights will blink once. 4. If the lock button is pressed once more within 4 seconds, the hazard warning lights will blink and the horn will sound once. 5. Make sure that doors are locked by checking the door lock button inside or pulling the outside door handle. 1. Press the unlock button(2). 2. The driver's door will unlock. The hazard warning lights will blink two times. 3. Press the unlock button(2) twice within 4 seconds and all doors and tailgate will unlock. The hazard warning lights will blink two times. You can activate or deactivate the Two Turn Unlock function. Refer to "User settings" in this chapter. The tailgate is unlocked if the button is pressed for more than 1 second. Also, once the tailgate is opened and then closed, the tailgate will be locked automatically. The horn sounds and hazard warning lights flash for about 30 seconds if this button is pressed for more than 1 second.To stop the horn and lights, press any button except the trunk button on the transmitter.